With powerful processing and long battery life, the ThinkPad T470 is designed to enhance your productivity, anywhere. Easy to use, deploy, and service, this robust laptop has a host of cutting-edge technology, including fast storage, and secure fingerprint reading. With powerful processing, a superb operating system, and long-hour battery life, the ThinkPad T470 is designed to enhance your productivity, anywhere. Easy to use, deploy, and service, this 14” robust laptop has a host of advanced technology, including improved storage and secure fingerprint reading. All of this, plus the legendary ThinkPad reliability. Every ThinkPad laptop undergoes main stringent military tests and numerous quality checks. So, you can rest easy, knowing, that your T470 is more than capable of surviving the bumps and bruises of everyday life. You can say goodbye to unwanted distractions. And hello to a faster laptop, from startup to shut down and everything in-between. 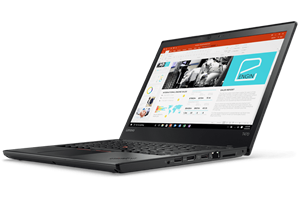 Lightweight and thin, the T470 gives you portability, without sacrificing performance. Its 14" display delivers sharp, vibrant visuals — perfect for working on the go or kicking back to enjoy a movie.